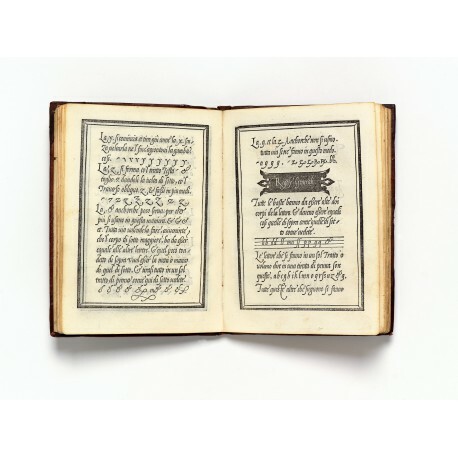 Second edition of Palatino’s enormously popular calligraphy book, noted for its examples of cursive chancery scripts, mercantile hands, and national hands, but including non-western scripts (Hebrew, Chaldean, Arabic, Greek, Egyptian, Syrian, Indian, Cyrillic, etc. ), a rebus, and cipher alphabets, as well as “Lettera Mancina” (right-to-left handwriting, of the kind practised by Leonardo). Only four other copies of the edition can be located ● Bergamo, Biblioteca civica “Angelo Mai” ● Nuremberg, Germanisches Nationalmuseum ● Rome, Biblioteca nazionale Centrale Vittorio Emanuele II ● Turin, Biblioteca Reale. 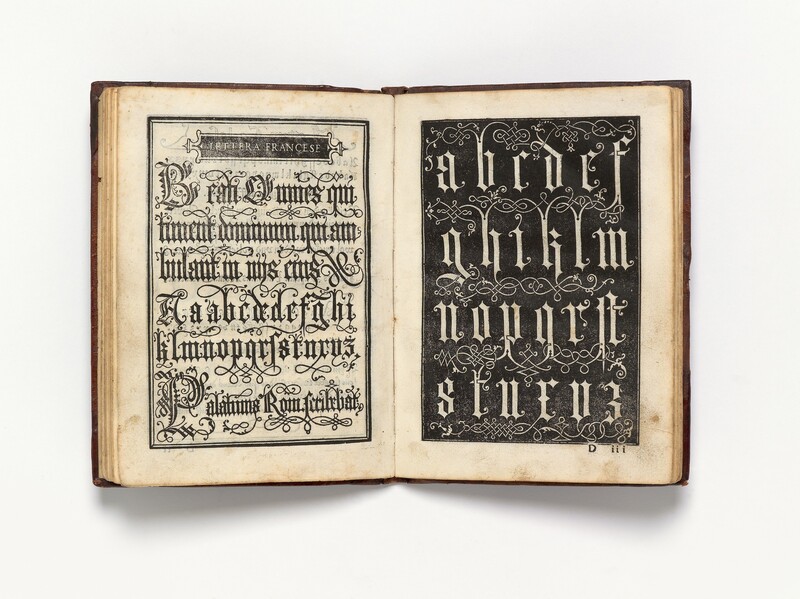 The present copy was bound at Augsburg about 1560 in a style inspired by Italian models. On the upper cover, displayed within a double-ruled-lozenge, is a stamp (height 19 mm) of the civic insignia of Augsburg, the “Stadtpyr” or “Zirbelnuss” (pine cone) set on a column base. Libro nuovo da imparare a scrivere tutte sorte lettere antiche et moderne di tutte nationi, con nuove regole, misure, et essempi. quarto (182 × 132 mm), (52) ff. signed A–F8 G4, not foli­ated or paginated. Woodcut portrait of the author on title-page, sixty-nine full-page woodcuts by an anonymous block­cutter, author’s emblematical device (a moth fluttering over a candle flame, accompanied by a verse from Petrarch) on final leaf. Wormholes in margins of nine leaves, occasional ink spot and other signs of use. Repairs to binding, front free-endpaper renewed. binding contemporary South German brown calf over thin paper boards, decorated in blind, on both covers a rectangular panel orna­mented at each outside angles by a fleur-de-lis and along each side by twin lotus leaf scrolls, the panel on the upper cover enclosing the civic insignia of Augsburg (a pine cone on a pedestal) between a pair of medallion heads; the undeco­rated back divided into five compartments by four raised bands; plain page edges; cloth ties lacking. Palatino, a notary ‘by Apostolic authority’, played an active part in Roman intellec­tual life as secretary of the Academy of the Sdegnati, an informal association of humanists founded by Girolamo Ruscelli, where he befriended Francesco Molza and Claudio Tolomei (both mentioned here in the dedicatory address to Cardinal Robert de Lenoncourt).2 The first edition, printed in Rome by Bernardo Giunta for Baldassare Cartolari, is dated 12 August 1540; our second edition, as well as the third, were anonymously printed for his widow Girolama Cartolari (‘nella Contrada del Pellegrino per la Moglie che fu di Baldassarre de Cartolari Perugino’) and are dated 2 October 1543, and May 1544, respectively.3 The blocks passed in 1545 to Antonio Blado, who brought out an enlarged version in numerous editions; then in 1561 to Valerio Dorico, who revised the book again; and in 1578 into the hands of Venetian printers. On the upper cover, displayed within a double-ruled-lozenge, is a stamp (height 19 mm) of the civic insignia of Augsburg, the ‘Stadtpyr’ or ‘Zirbelnuss’ (pine cone) set on a column base.17 It is flanked by two heads in profile encircled by laurel wreaths, impressed by ordinary finishing tools: on the left, a man with a pointed beard, and two ribbons hanging down over his nape (perhaps Henri ii); on the right, an unidentified emperor, crowned, also with a ribbon in his hair. 1. Arthur Osley, Luminario. An introduction to the Italian writing-books of the sixteenth and seventeenth centuries (Nieuwkoop 1972), p.50; see further, Arthur Osley, The tools of hand­writing: from Palatino's writing manual of 1540, Un nuovo modo d’imparare Giovambattista Palatino (Wormley 1972). 2. James Wardrop, ‘Civis romanus sum: Giovanbattista Palatino and his circle’ in Signature, new series, 14 (1952) pp.3–39. 3. Deborah Parker, ‘Women in the Book Trade in Italy, 1475–1620’ in Renaissance Quarterly 49 (1996) pp.527–528. 4. These copies are lost or unidentified: Bernard Quaritch, ‘Catalogue of the Monuments of the Early Printers’, London 1888, no. 36534 (‘vellum, £5’); Jacques Rosenthal, ‘Catalogue of a part of the valuable and extensive Library of Cavaliere Andrea Tessier (removed from Venice)’, Munich, 21–23 May 1900, lot 912 (‘Br.’); James Tregaskis and Son, Catalogue 973, London, [circa 1928?] (copy cited by A.F. Johnson, op. cit., p.32). 5. Luigi Chiodi, ‘Le cinquecentine della Biblioteca Civica “A. Mai” di Bergamo’ in Bergomvm 67 (1973), p.254. 6. J. Stockbauer, ‘Die Bücher der Schreibmeister des 16.–18. Jahrhunderts im germanischen Museum: Nachtrag’ in Mitteilungen aus dem germanischen Nationalmuseum 1 (1884–1886), p.101. 7. Fernanda Ascarelli, Le Cinquecentine romane: ‘Censi­mento delle edizioni romane del xvi secolo possedute dalle biblioteche di Roma’ (Milan 1972), p.187. 8. Located by Edit 16 (Censimento nazionale delle edizioni italiane del xvi secolo: http://edit16.iccu.sbn.it). 9. 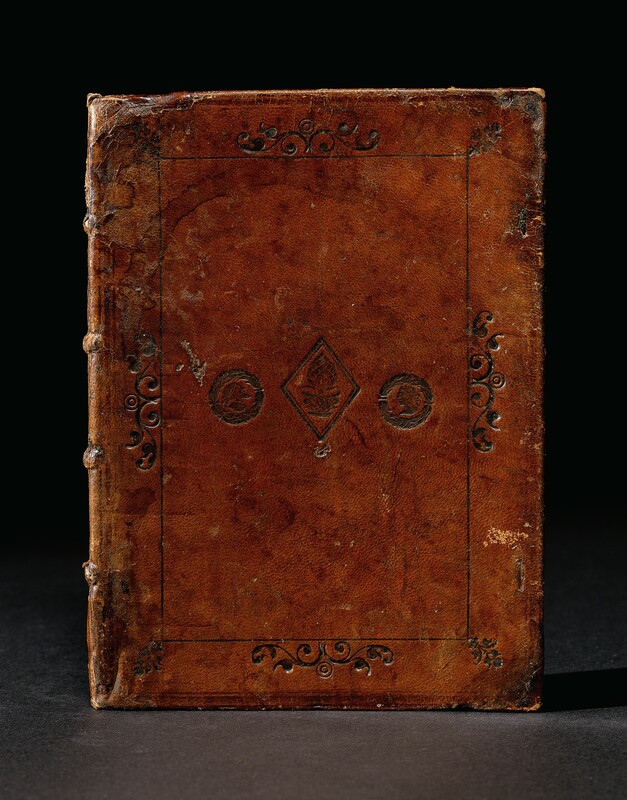 This copy is unlocated: Laurent Coulet, ‘Catalogue 45: Livres anciens et modernes’ (Paris 2010), item 13 (‘reliure moderne faite avec un vélin ancien’, €8000). 10. ‘Donne tipografe’ tra xv e xix secolo, catalogue of an exhibition in the Aula magna, Biblioteca universitaria, Bologna, 8 March–10 May 2003 ([Bologna] 2003), p.20. 11. The Cathedral libraries catalogue. Books printed on the continent of Europe before 1701 in the libraries of the Anglican cathedrals of England and Wales, edited by David J. Shaw (London 1998), P–61. 12. Axel Erdmann, My gracious silence: women in the mirror of 16th century printing in Western Europe (Lucerne 1999), pp.143–144 no. 137. 13. Catalogue of printed books and manuscripts bequeathed by Francis Douce to the Bodleian Library (Oxford 1840), p.206 (shelfmark Douce PP 262). 14. 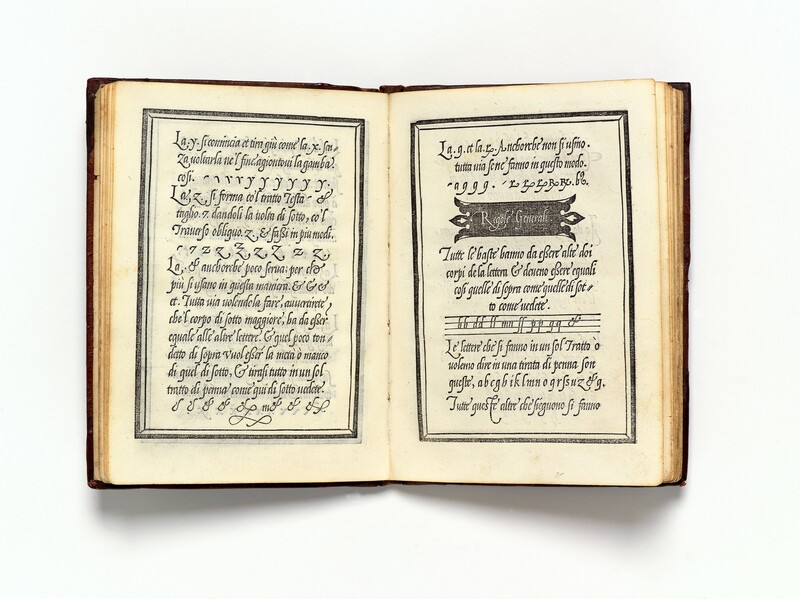 Anthony Hobson, Renaissance book collecting: Jean Grolier and Diego Hurtado de Mendoza, their books and bindings (New York 1999), p.129. 15. G.D. Hobson, ‘German Renaissance patrons of bookbinding’ in The Book Collector 3 (1954), p.252. 16. Ferdinand Geldner, ‘Unbekannte Fuggerbände, die Fuggerschen Supralibros und die anonymen Augsburger Fugger-Meister’ in Archiv für die Geschichte des Buchwesens 5 (1964), col. 1222, Abb. 21. 17. Other versions of this tool appear on an elaborately gold-tooled binding presented by Jakob Krause to the Stadtrat in 1564 (Ilse Schunke, Leben und Werk Jakob Krauses, Leipzig 1943, p.42) and on a binding of circa 1569 (Ingebord Salzbrunn, Die Einbandsammlung der Staats- und Stadtbibliothek Augsburg, Gläshutten im Taunus 1976, nos. 22–23). 18. 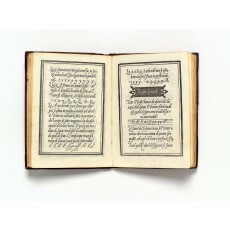 Ilse O’Dell, Deutsche und Österreichische Exlibris 1500–1599 im Britischen Museum (London 2003), nos. 15–27.